Visitors are drawn to Jamaica for a variety of reasons; the beautiful beaches, the laid-back life style of the islanders, and of course the incredible Blue Mountains. Filled with lush vegetation and jaw dropping views, the mountain range dominates the eastern third of the country. With the highest peak sitting at 7,402 feet, the Blue Mountain range spans 24 miles and borders the eastern parishes of Portland, St. Thomas, St. Mary, and St. Andrew to the south. Just below 5,500 feet lies a rich forest reserve, housing one Jamaica's most valued assets; Blue Mountain Coffee trees. This fertile treasure was the playground where Edgar Munn grew up. As a boy Edgar could not have realized the importance of the lessons he was learning from his uncle Keble, as together they walked the mountain slopes, but those lessons were well ingrained in Edgar. He not only learned how coffee is grown, cultivated, and processed, but he learned about the real heroes of the coffee industry; the coffee farmers. The men and women who carefully plant and nurture the precious coffee trees also devote themselves to harvesting and handpicking each bean. Keble insisted on buying the local farmer's crop, no matter how small the yield. Part of Keble's life philosophy was to encourage the farmers from the local community. He continually encouraged the locals to grow and sell their own coffee. This persistence eventually bloomed into a rich culture of micro farms and single estate coffee factories. Starting in the eighteenth century Jamaican Blue Mountain Coffee became known around the world, and its popularity grew prominently in the nineteenth century. It was in 1885 that Cecil Augustus Munn planted his first round of coffee plants on Strawberry Hill and began his family's history of world class coffee. Disaster struck shortly thereafter, and Cecil's crop was consumed by a wildfire. This was particularly difficult because coffee plants don't produce their first crop for 3 to 5 years after being planted. Despite the hardship, Cecil pushed on, and with the support of friends and family he replanted his crop. Only a few years later the world was introduced to Cecil's coffee. In 1920 Cecil's son Victor built the Mavis Bank Central Factory. Victor's nephew, Keble Munn, carried his family's business further. He became Jamaica's first Certified Cup Tester, and was the first person to export Blue Mountain Coffee to Japan. He was also a former Minister of Agriculture. Early in the 1950's a few of the local coffee farmers and producers helped form the licensing that regulated the coffee estates and production facilities. Among those instrumental in forming what became the Jamaica Coffee Industry Board, was Keble Munn. Several farmers began sending their coffee to Munn's processing facility, at Mavis Bank. There were four original processers of Jamaica Blue Mountain Coffee: Wallenford, Moy Hill, Silver Hill, and the Mavis Bank Coffee Factory. Only Wallenford and Mavis Bank are still in business. In order to protect the prestige of Jamaica Blue Mountain Coffee, the country has strict regulations set in place to regulate the coffee's production and exportation. The Jamaican Coffee Industry Board defines strict geographical boundaries outside of which JBMC cannot be grown, and it inspects all coffee before being exported. Edgar Munn is certified by the Jamaican Coffee Industry Board to import and sell Jamaica Blue Mountain Coffee in the United States. The Munn Family grew particularly close to the founders of the Flamstead Estate. Their friendship goes back generations, and now, Edgar acquires their coffee directly and continues to grow their close family ties. At 4,000 feet on the Blue Mountains, another micro farm is found, this one owned by Arthur McGowen. Edgar has known Arthur for many years and was instrumental in building Arthur's factory. Arthur brings more than 15 years of experience growing and manufacturing coffee on the Blue Mountains. His character is marked by determination, ingenuity, and integrity in his trade. Edgar continues to make annual trips to see Arthur on his estate and meets him at annual coffee events held in the US. The local farmers expressed gratitude to the Munn family for their commitment to them and the family continues to be well respected by the local farmers. Keble Munn received the Specialty Coffee Association of America's prized Lifetime Achievement Award in 1995. Due to his age, Keble was unable to personally receive the award, so he entrusted Edgar to receive it on his behalf at the Fontainebleau Hotel in Miami, FL. Even after his death in the spring of 2008, Keble Munn is well loved and respected throughout Jamaica. Edgar continues to roast the highest quality of handpicked Jamaica Blue Mountain Coffee; this is only possible because of the micro farms and single estate coffee factories that partner with Edgar. The roasting process today is completed automated. With the proper high-quality equipment, and knowledge of the heat profiles at which each bean best roasts, a consistently perfect roast can be achieved every time. 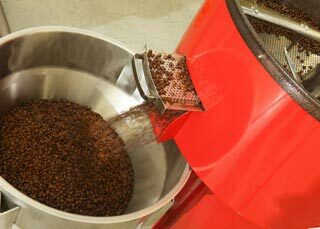 Once brought out by roasting, it is the flavor in the coffee bean itself that delights and intrigues the taste buds. The local farmers in Jamaica can bring this directly to you because of their relationship with Edgar Munn. When you drink Blue Mountain Coffee you are helping support thousands of people and local farmers. To many it is just a cup of coffee, but to the Munn family it is generations of tradition and Edgar is honored to continue the rich heritage that was instilled in him as a child.